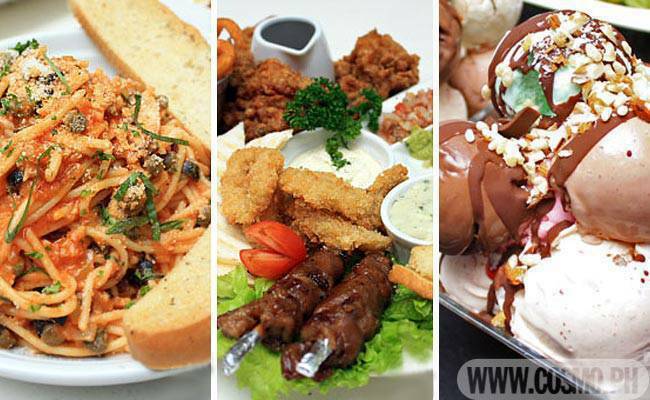 Go On A Sulit Food Trip With Your Barkada! Try out these restaurant group platters that are perfect for huge appetites--on a tight budget! Since we all have several days off this month, thanks to sembreak (for college students) and the upcoming long weekend (October 29-November 1), why don't you round up the gang for a food trip that's tailored to barkadas? Lucky for you, the Venice Piazza at McKinley Hill has a limited promo for groups of eight people or less, which offers bestselling dishes from your favorite restos at a super sulit price! You can avail of the "Platter For 8" promo on weekends from October 15 to November 27 at any of the 14 participating restaurants. Best of all, each of the party platters, good for eight persons, costs only P800 (that's P100 per person for a group of eight)! We recommend going restaurant-hopping each weekend so you can try the various offerings. Sweet Pea offers the James Dean Platter, which is overloaded with cheesy quesadilla, breaded fried chicken, onion rings, twister fries, crostini bread with dip, and two pieces of yummy pork barbecue. Carlo's Pizza offers the Fantastic Four Platter with different colored nachos, deep fried onion rings, buffalo wings, and cheesy potato wedges. Stacker's Burger Cafe offers the Auss'm Party Platter, which includes spaghetti with tomato sauce and a separate platter of fried chicken, fried mozzarella sticks, French fries, and a side salad. Pincho's Restaurant and Bar offers the Nachos and Wings Platter, which consists of spicy buffalo wings with blue cheese dressing and celery sticks, and a huge platter of nachos drizzled with cheese, beef, and salsa. Empire Deli offers the Empire Italian's Platter, which has a whole roasted chicken, an order of pasta pomodoro, and a plate of greens. Blackwood Bistro offers a triple treat for pasta lovers: the Pasta Trio Platter, made up of three different pasta dishes--pesto linguine, cream fettuccine, and tomato-based penne--served with a plate of herbed bread. Old Vine Grille serves potato wedges with the Fish and Steak Platter--their version of steak and creamy dory in caper sauce, with a bit of salad on the side. KBOP offers the Korean Group Meals Platter, a massive meal that consists of spicy squid, kimchi-filled dumplings, chap jae (glass noodle dish), Tomichim (a fish dish), a side of veggies, and eight cups of white rice. Little Asia Symphony of Flavers offers the Asian Platter, which includes Chinese-style fried chicken, squid, spareribs, and a separate plate of noodles. Kuse serves a gigantic Salo Salo platter perfect for those craving for Pinoy comfort food! It comes with fried tilapia, spareribs steak (like your fave liempo, only saucier), a ripe tomato sidedish, and a generous amount of rice--all served on a bed of banana leaf! The Red Crab Alimango's House offers the filling Arianne's Platter, a collection of fried and breaded eggplant, fish, mussels, chicken, meatballs, squid, and onion rings, also served on a bed of banana leaves. Ramen Bar offers the Yoshi Platter, which includes eight bowls of Ramen paired with Japanese cua pao. Oishi des! Tokyo Cafe offers more Westernized Japanese delights with the Nakayoshi Platter, a collection of breaded tempura, cordon bleu, fried chicken, and French fries, with separate servings of rice. Sol Gelato caps off your meal with Cheaper by the Dozen: 12 scoops of different flavors of gelato in a mountain heap your barkada can dig into! Be sure to pair your meals with affordable drinks! The Venice Piazza has another promo called "Everyday Happy Hour," which runs from October 17 to December 31, 4PM-8PM, at select restaurants. You can avail of beer at P30 per bottle daily, plus buy one, take one cocktails at P40 on weekends. While you feast, enjoy the musical entertainment they offer at the Piazza, such as the weekly rockeoke (Wednesday at 8PM), ballroom dancing (Thursday at 8PM), and band performances! This is the place to be for good food, quality booze, and a fresh Italian ambience to boot! You don't have to fly to Venice to experience world-class cuisine with your friends, so invite the barkada and have a food trip at Venice Piazza! Launch the gallery to see mouthwatering photos of all the platters for eight. Venice Piazza is located at McKinley Hill, Fort Bonifacio, Taguig City. For inquiries, call the Megaworld Concierge at 709-0888 or 709-9888, and visit the official website.